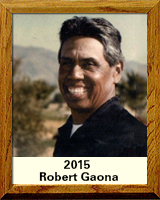 Robert (Bob) Gaona began playing golf at the age of 12. He got his start as a caddy at El Rio Country Club directly across the street from his childhood home. Gaona entered Tucson High School in 1954. He was an accomplished player, making the golf team that same year and played until his graduation in 1958. As an amateur Gaona participated an d won many local events. In 1956, he qualified for the National US Junior Tournament in Williamstown, MA. Then in 1958, He was part of the Arizona High School Championship Team where he was a Medalist Champion, a school scoring record that stood for over 40 years. In 1972, Gaona became a professional golfer and became the Golf Coach at Pima Community College for 16 years. In 1987, he qualified for the US Open Championship at the Olympic Club in San Francisco, CA. In 1988, he was awarded the Southern Chapter Southwest Section PGA Senior Professional Player of the Year. Later, he qualified for 5 Senior US Opens, playing in more than 100 Senior Tournaments from 1989 to 1995. Since 2012, after being diagnosed with a rare form of cancer, Gaona has dedicated his life to helping others while he continues giving back to the community. He credits much of his success personally and professionally to the friends and family who have always helped him live life to the fullest and how in his latest battle with cancer. Gaona continues to teach juniors and adults giving back with more than 65 years of experience.